For better or worse, romantic relationships greatly influence us. Some romantic couples appear to form a “drinking partnership” (Roberts & Leonard, 1998) with men and women influencing each other’s drinking because of pressure to conform, a desire for belonging, or mere exposure to their respective drinking habits. 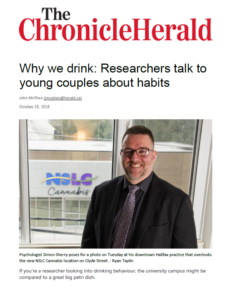 Dr. Simon Sherry discusses work from his research team suggesting one partner can influence the alcohol misuse of the other partner in a romantic relationship.